It all started during the latter half of 1977 when Peter Meanwell was approached by John Varley, a member of the Crufts Dog Show Committee. John's responsibility was the 'spare time' in the main arena between the end of the Obedience championships and the commencement of the group breed judging. Various dog training demonstrations had been held over the years, some of which included dogs jumping. John Varley's idea was a dog jumping competition which probably had its birth from his connection with the horse world. Being an excellent showman, he knew the type of event he had in mind but needed a practical dog training person to supply the answers. He contacted Peter asking him to devise a test and the appropriate equipment, with part of the brief being that it should be suited to the hard Olympia floor. Peter's vast practical dog training knowledge plus many years spent as a successful Working Trials competitor soon enabled him to plan the basic principle. The main factors he always kept in mind were it should be a fun event without being dangerous and that it would provide spectator appeal. From Wikipedia... It was reported in Our Dogs newspaper that in 1974 Meanwell had either been a witness to or participated in such a competition at an agricultural fair, thus predating more widely published accounts for the start of dog agility. By some oral accounts, there was an earlier demo with similar intent using playground articles such as a seesaw and tunnel although this has not been documented. Another account attributes the other obstacles to exhibitions by the Royal Air Force K-9 Corps exhibitions of the time, which is more plausible, given the nature of the first regulations for dog agility in the UK. Several of Peter's friends in the Lincoln area including Stuart Gillam, Kevin Foster and Albert Davies who were to become his team, helped build the equipment. Fred Welham and Trevor Jones of Yorkshire also made invaluable contributions. Peter realised that to add interest it would be necessary to involve another club so he contacted Trevor Jones of the Yorkshire Working Trials Training Society to produce a team of four dogs. All the people involved at this stage helped each other with training ideas and modifications to equipment where it was felt that an improvement could be made. The first actual agility demonstration actually took place on the first day of the show, Friday, 10 February and, according to a report in The Kennel Club Gazette, it took place in the 'big ring' before the Group Judging. After the the handlers had changed into smart tracksuits as a team uniform, they competed against each other with such success that it was obvious from the crowd reaction that this innovation would be seen again. The following year of 1979, after qualifying rounds, three teams appeared, and these were the Pontefract Dog Training Club, The Rugby Dog Training Club and The Yorkshire Working Trials Society. A further Agility milestone was reached when the finals of the Pedigree Chum Agility Stakes were held at the International Horse Show at Olympia during December 1979. The first Agility Test to be run under the new Kennel Club Regulations was the event staged at Crufts 1980. The three teams to qualify at an eliminating round to compete in this event were Pontefract DTC, Yorkshire WTS and the Waldridge Fell TC. Appropriately it was judged by Peter Meanwell, who having been mainly responsible for the sport's development, had the onerous task of being the first judge to interpret the regulations. Without doubt this was a wise choice, for who could be better than the sport's innovator to handle the first official test. Knowing his enthusiasm, he asked Peter Lewis to act as his score steward which he willingly accepted as he wished to play a full role in helping to establish what he had started. In the very brief time they were in the main Crufts arena, it was apparent that this sport was a winner with the spectators. The reaction of the crowd being so generous made it obvious that the Kennel Club had for the first time a genuine spectator sport on their hands. All the ingredients of crowd appeal were apparent. Each dog completed a round in under one minute so no spectator had to concentrate on a particular dog for long periods of time. The way a dog was faulted, whilst inevitably not being quite so simple as Show Jumping, was so much easier for the spectator to understand than other forms of dog competition. The fact that the dogs competed against the clock injected a speed element and with all these facts thrown together the result was an all action event that pleased the crowds. In 1980, The Kennel Club became the first organisation to recognize agility as an official sport with a sanctioned set of rules, and the first agility test to be held under the new regulations was the team event at Crufts that year. The event was judged by Peter Meanwell, with Peter Lewis as his scribe. Peter Lewis and John Gilbert (one of the few original 1978 competitors who continues to participate in agility competition, training, and judging) went on to play a major part in spreading the sport of dog agility across Europe and around the world. 1983 saw the founding of the Agility Club, the first national agility club in the UK publishing the Agility Voice, the first agility magazine. 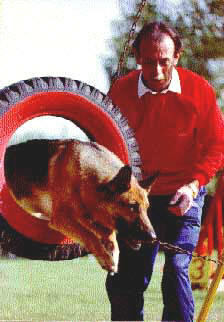 In the early 1980's John Varley emigrated to Sydney, Australia, to work with the PAL Superdogs Demonstration Team, (an 'Agility-like' performance event, with very large obstacles). Living in the foothills of the Blue Mountains, west of Sydney, a few years later John became very ill and died later that same year.